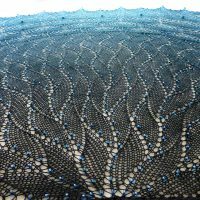 Shimmering beads light-up a gradient black-to-peacock-blue sky in this striking Lightning Thief shawl. 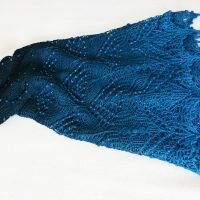 Hand-knit in a gorgeous Vivid Fiber Arts, Blue Nocturne Tencel yarn, this shawl drapes delightfully across your shoulders, its intense blue color catching the eye of all who see it. 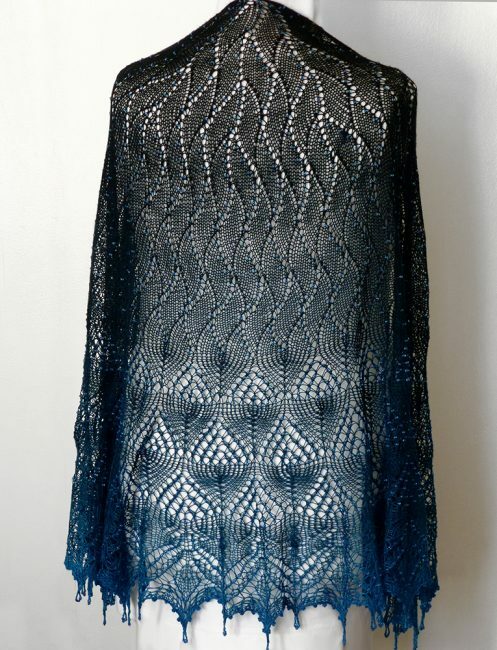 A word of warning: you’ll steal the scene wherever you wear this stunning shawl. 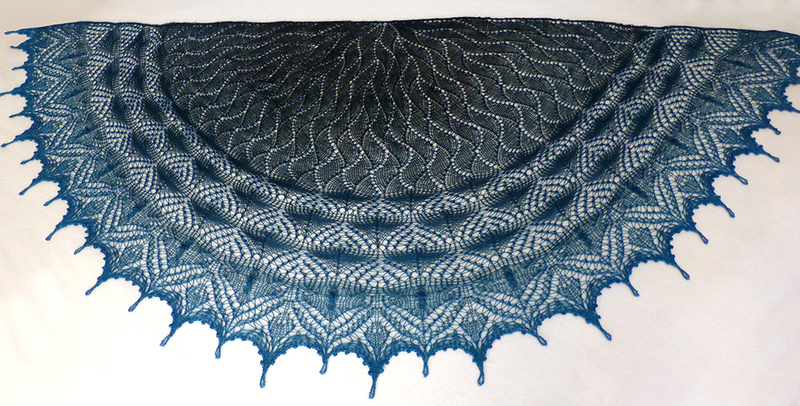 This is my second time around knitting this Lightning Thief shawl pattern and it was a breeze. Not sure if I’m more experienced in knitting or if the stars aligned just right, but I didn’t have nearly the issues with the lightning bolt area as I did the last time. I went off pattern on the second half, tripling the repeat so the balance would be more similar to the smaller shape in this large size. Needed to add some additional stitches in the last part, but it really finished off the edging and I’m glad that I did. And the beads are just perfect for this colorway. I don’t think I could have gotten a closer match. I was afraid to count how many I ended up using, but I’d ordered 3000, and I didn’t have a lot left over. Seriously glad to have this one behind me and a few shawls coming up next in the queue without beads. I adore working with this yarn, but I’m beaded out at the moment. 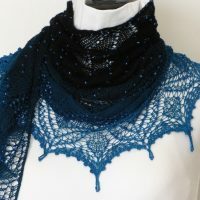 Color: Black to peacock blue gradient. Size: One size (S – XL), Measures 62″ wide by 30″ long. 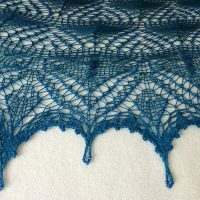 **Special thanks to Lily Go (Lightning Thief shawl) for creating such a lovely pattern and Vivid Fiber Arts for creating such beautiful yarn.